I got back this early morning from Rome where I completed my Via Francigena . The last 100 km-Camino from Viterbo to Rome, Italy was most certainly backbreaking and hard on my poor knees. You bet we all felt wasted after each day of 6-9 hours of walking! The first day was without a break for coffee, beer or even pee stops. If you need to go, it’s bush land for you. No town in-between. Somehow, I missed the lively vibe in the Camino Frances’ last 100km stretch. Walked 5 days and Day 2 was excruciatingly difficult at 30kms with only 1 break for late lunch before meandering in woodland. We crossed a stream 3 times and I must confess those improvised bridges weren’t meant to encourage walkers. Day 3 was cold and wet. Day 4 was hot and humid. The 5th and last walking day towards Rome was most uninspiring. Roadside walks but most times, no sidewalks. Was I glad we were a big group and a fun group too. In all, we met only 9 other pilgrims. They, on the other hand, must have been pleased to meet our group of 11 pellegrinos. So unlike my Camino Frances last year. Same last stretch of the final 100+ kms. But no way like it. 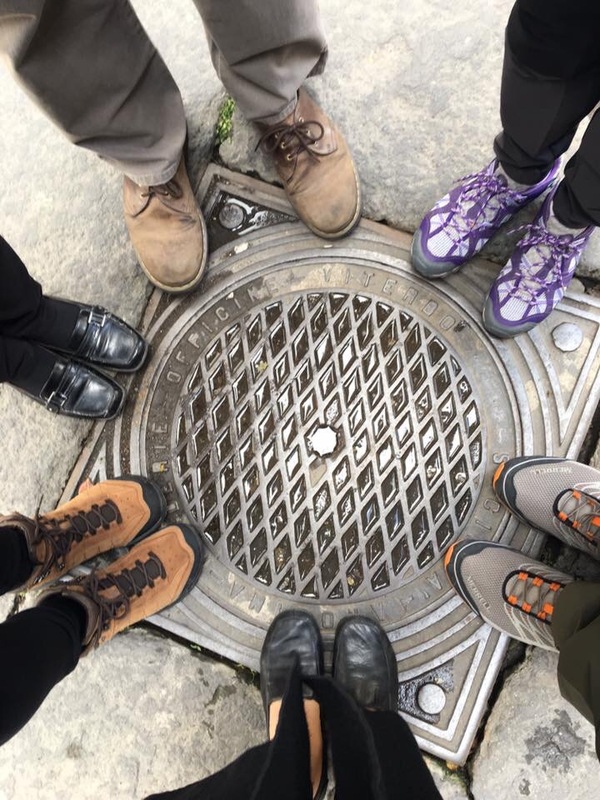 So here are some lessons learned from this Italian Camino. None to Barely any breaks for snacks, toilet or just to sit it out. Water bottles a must or dehydrate! Prepare for ALL weather. Hot. Cold. Dry. Wet. Needless to say, you need a good raincoat and walking shoes that keep your feet dry. Layer up! Peel off as necessary. Medications, first-aid kits welcome. We met a couple along the way. The man took a bad fall and they had to quit. They hitched a ride back to town. As we walked, we imagined how it could have been much worse if it happened in the bush land, where we meandered for well over 3-4 hours. Lunch stops are for lunch. But don’t overstuff yourself just because you’ve been walking hungry for hours. An energy bar when you’re feeling tired and deprived should suffice. Quit the coffee and beer. With no toilet in sight, it’s best to walk semi-hungry. Alcohol is dehydrating. Save it for dinner times. Don’t count on meeting people along the Camino trail. Pellegrinos are very, very scarce. Neither is the trail lined with cottages with people living in them. Souvenirs? Forget it. No Camino shells, VF t-shirts, pins etc. I’m no collector, but I would have bought refrigerator magnets and key chains if there were any. Stamp your pilgrim passport in the hotels and trattorias where you stayed/ate. There were hardly any tiny chapels along the trail nor in the hamlets we passed. When found, the chapels were either closed or without stamps. At times, we wondered if they’d know if we walked or bused in. The equivalent of a Pilgrim’s Certificate after walking a minimum of 100 kms is called a Testimonium. This can be obtained in a Center in the St. Peter’s Square in the Vatican. The same Center SELLS tickets to the Vatican Museum and other stuff. So if you think it’s a dramatic moment to have pilgrims lined up to be certified and recognized, you’re dreaming. Do your research on where to sleep, eat, have your credenziale stamped, and where to obtain your Testimonium. Even in the Vatican itself, hardly anyone in uniform know what Via Francigena is all about. Lastly, I didn’t bring a camera for this Camino. I made do with my iPhone6 plus which takes decent shots. My friend’s Samsung takes even better shots. So we were able to document and chronicle our walk without the unnecessary weight. So there. We survived the VF, and we’re lucky to be walking together. I dare say the Via Francigena is NOT ideal for solo or lone walkers. Watch this page for more photos and details on our day-to-day Camino experience from Viterbo to Roma.